We’ve been spoiled rotten of late by wonderful footage of G.L. Watson’s masterpiece, Britannia, from the recently fully released Pathe archive. This, from 1931, is particularly fine – and rare because she’s in passagemaking mode: the galley stove pipe and her huge forepeak ventilator are in position forward of the mast; her beautiful gig is hoisted in the davits. Who is that at the helm dressed for the city? How big is that trysail? And the camera can get close alongside because she’s not racing. Britannia was “Clydebuilt” by D. & W. Henderson, Partick, Glasgow in 1893. She features on the front cover of Martin Black’s biography of her designer: G.L. 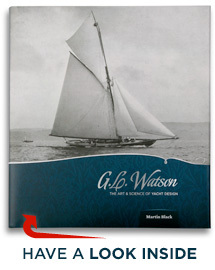 WATSON – THE ART AND SCIENCE OF YACHT DESIGN. http://peggybawnpress.com . This entry was posted in archives, art, Big Class, boatbuilders, boatyards, book, Britannia, Clydebuilt, film, Firth of Clyde, G.L. Watson, G.L. Watson & Co., Glasgow, Martin Black, naval architect, object of desire, replica, River Clyde, shipbuilding, shipyards, yacht design, yacht designer, yacht racing, yachting history and tagged Big Class, Clydebuilt, D. & W. Henderson, davits, gig, Partick, stove pipe, trysail. Bookmark the permalink.